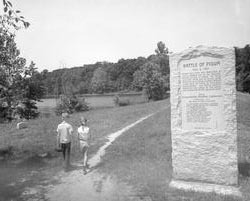 The Battle of Piqua, also known as the Battle of Pekowee or Pekowi, was part of the western campaign during the American Revolutionary War. Led by General George Rogers Clark, over 1,000 soldiers (among them Daniel Boone and Simon Kenton) crossed the Ohio River near present-day Cincinnati and burned five Shawnee villages, including Old Chillicothe, along the Little Miami River. Peter Loramie's Store, a British trading post-located in what was later Fort Loramie, Ohio in Shelby County, Ohio-, was also burned by Clark's men. The Shawnee gradually withdrew during the first few days before finally engaging American forces 7 miles west of Springfield, Ohio on August 8, 1782. 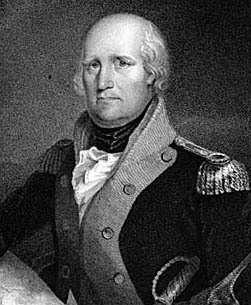 Joseph Rogers, a cousin of George Rogers Clark, had previously accompanied him to Kentucky and was later captured by the Shawnee near Maysville. Despite having been adopted by the tribe, he was killed during the battle while trying to join American forces. In retaliation for an Indian assault on Kentucky, George Rogers Clark and his 1,000 Kentucky Rangers invaded the Miami Valley. In 1782 Clark attacked a Shawnee army of 1,000 near Piqua. Clark defeated the Shawnee at the battle of Piqua and the Shawnee stopped all activities against the Americans for the remainder of the Revolutionary War. After the Battle of Piqua, Clark made a point of aadvancing on and destroying Peter Loramie's store. Soon after, Loramie left the area with a group of Shawnee and relocated west of the Mississippi River near Cape Girardeau, Missouri, and became known as Don Louis Lorimier as he continued his work as an Indian agent, this time for the Spanish. Loramie would work for three different governments in his lifetime -French, Spanish and American. While commanding Spanish forces in the Cape Girardeau area, Loramie met with Meriwether Lewis at the start of the Lewis and Clark Expedition.